One impact of the countywide Transit Master Plan is an extra cost to Ann Arbor. What are the others? On December 12, 2011, AATA CEO Michael Ford presented an overview of the Transit Master Plan to the Ann Arbor City Council. He also discussed the pathway to a countywide authority, which begins with a 4-party agreement that would pledge Ann Arbor’s current transportation millage to the new countywide authority (see diagrams in our previous post). In the Ann Arbor Chronicle’s brief summary of the meeting, several councilmembers raised two questions. Second, they “questioned how the transit service benefits to city of Ann Arbor taxpayers would be guaranteed”. Ann Arbor will bear most of the cost. This general estimate is in agreement with what is being said at the conference table. In meetings of the Financial Task Force “uses” subcommittee, similar estimates have been made. At the December 16 meeting, staff coordinator Michael Benham mentioned a figure of 60%, and at an earlier meeting, Terri Blackmore (executive director of WATS and a transportation professional) mentioned “2/3”. It is broadly acknowledged at committee meetings that Ann Arbor taxpayers will be bearing the greatest share of the costs of the expanded plan. Another impact on Ann Arbor’s total share of the cost is that with the countywide plan, other local governments would no longer pay the Purchase Of Service Agreement (POSA) charges for their bus service. This POSA income brought $1.3 million into the system in 2011. That means that the millage will have to pick up the difference. The actual programs to be supported by this increased millage and their relative costs are hard to get one’s arms around. The Financial Task Force subcommittee has been moving the pieces around a bit and suggesting some priorities and fare changes. What follows is based on the original program budget as proposed. The urban bus system that incorporates Ypsilanti will become a fully realized network. In its most recent budget, AATA has already begun to shoulder some of the costs of extending bus service into Ypsilanti. Ford has dismissed concerns that this violates the Ann Arbor charter millage by stating that it benefits businesses in Ann Arbor to be able to bring in workers. Regardless of whether that is a good argument, it makes sense from an urban planning viewpoint to have what is being called the “urban network” of public transit, and the increased service to the urban area east of Ann Arbor is a positive outcome. The TMP calls for “network enhancements” that include more frequent buses and longer hours. These are a significant part of the 5-year plan and some will benefit Ann Arbor riders. It also calls for better bus stops and “transit hubs”. Apart from longer hours and more frequent buses, few of these improvements will benefit Ann Arbor bus riders directly. Also, the 30-year plan actually calls for eliminating some Ann Arbor bus routes once the high-capacity connector lines are installed. Both Federal law (assuming a Federal subsidy) and our local preferences call for “demand” services to be furnished wherever fixed-route buses run. The demand services (mostly taxi-based) for handicapped and others needing special access will be expanded through the urban network. The annual cost of operating the Urban Network for the first 5 years is nearly identical to the AATA’s current budgeted total expenses ($30.4 million). Note that while most of the money goes to the urban area service in the first 5 years, the countywide service is nearly 10% of the total. 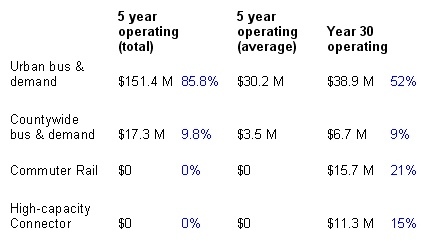 It also grows at a much faster rate over 30 years, maintaining its share of the larger operating budget in Year 30. In contrast, the urban service becomes a much smaller percentage of the total. But note that the reason for a very high operating cost in Year 30 is that 36% is dedicated to two new systems: commuter rail and high-capacity connector. Heavy investments in high-capital future projects are a large proportion of costs. The TMP is a 30-year plan, which means that programs that will not benefit riders until far in the future will start to cost the system much earlier. AATA and its TMP planners are only producing a full financial plan for the first 5 years but there are budgets for the full 30 years that predict a high-cost system that local taxpayers will begin to pay for right away. 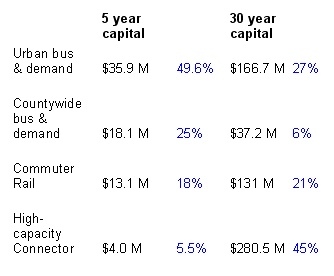 The two big-ticket items, commuter rail and the high-capacity connector, account for almost exactly two-thirds (66%) of the capital needs over 30 years. Of course, supporters of these projects will say that most of the money will come from Federal and state sources, but there is no guarantee of this, and there are always local matching fund requirements. They are also taking a significant percentage (23.5%) immediately within the first 5 years, though no service will be available. What is that “high-capacity connector”? The Connector Feasibility Study (pdf of large final report linked here) was jointly funded by the City of Ann Arbor, the DDA, the University of Michigan, and AATA. We discussed some of the early planning for it in our post, “Our Shining City on a Hill“. The technology used could be light rail, monorail, gondolas, or bus rapid transit; it hasn’t yet been determined. At this writing, either light rail or BRT seems more likely. This is now called the “North-South connector” in the TMP. Another high-capacity route, called the “Washtenaw Corridor” (and presumably presaged by Reimagining Washtenaw) is to run from the Jackson-Wagner intersection to the water tower in Ypsilanti. An inescapable conclusion from examining these budgets and the TMP is that it is really two plans. It does have a genuine plan for a better bus system for the Ann Arbor urban area. This is combined with some consolidations of existing service and some commuter-oriented express routes to aim for a partial countywide transit plan. But superimposed on that is a plan to direct our local transit dollars toward supporting two extremely expensive, high-capital transit systems that we do not presently have. As we have noted several times before, our mayor dreams of trains and has been planning for commuter rail for a long time. The nagging feeling that the TMP is in large part a means to achieve that is only confirmed by his recent comments on AnnArbor.com. 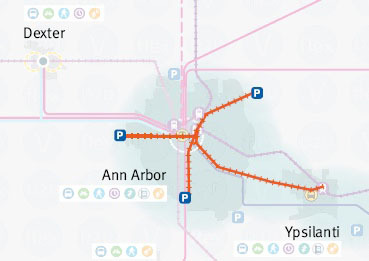 As for the Connector system, it is less likely to serve residents of the immediate Ann Arbor area than to assist the University of Michigan system with its needs to move students and employees between campuses and from commuting locations. In fact, its existence is planned to reduce local bus service. During the 5 years of the initial TMP, the amount allocated to this basic service is a flat $20 million per year, but that falls to $16 million at the end because, the consultants explain, riders will be on the high-capacity lines instead. Yet high-capacity lines (designed for rapid transit) are not suitable for local travel within smaller areas of the city. Actual or budgeted amounts for "Base urban bus service"
Here are some questions that I hope Council will consider before committing our millage and turning over our assets forever. Is a “county-wide” (but really a larger region) transit authority the best way to address our immediate urban transit needs (bringing in Ypsilanti)? What happens if the high-capital projects are begun with local funds but don’t receive further (Federal) funding? What happens if the 5-year plan is launched, but fails to be renewed by the voters just as some of the bills come due for the expanded capital projects? Let the people of the county decide. Hieftje said there are influential people on the west side of the state who seem to have the ear of lawmakers in Lansing who are talking about a sales tax to fund transit. “So I don’t know that we need to think this is going to be a millage at any point,” he said. “I can see how it always comes up, because that’s what people are used to, but there are a lot of other systems of funding transit being talked about right now, and I think we have a governor in place who has proven he’s transit-friendly. The 4-party agreement is signed by all 4 parties. The Board of Commissioners approves the Articles of Corporation. The new authority board is seated. A financial plan is presented that appears to meet budget numbers for the next 5 years. This could be through a combination of donations by parties who have an interest in the development opportunities afforded by the new system, possible new fees including the vehicle registration fee (which is still a long way from being enacted), fare increases, and even maybe some bonds for capital purposes. How likely is this? I don’t know. But please, Ann Arbor City Council, put in safeguards so that a millage vote is required. A move this big needs to have a vote of the people. The ballot is the only effective referendum. UPDATE: WEMU reports today (December 21, 2011) that the City of Ypsilanti failed to approve its participation in the 4-party plan after Pete Murdock raised issues about the dedication of Ypsilanti’s millage to the countywide plan. Apparently the issue will be revisited. SECOND UPDATE: Regarding some of the equity issues raised in comments on this post, readers might find the recent article from the Ann Arbor Chronicle of interest. The Chronicle reports on a discussion held at the Financial Task Force subcommittee meeting on relative proportions of service vs. tax contributions. THIRD UPDATE: AnnArbor.com has an article about an email sent by AATA Executive Director Michael Ford to Council. In it, Ford describes the “benefits to Ann Arbor” of the expanded countywide plan. Here is my analysis of his comments. Perhaps most significantly, many of the benefits he describes are the services that Ann Arbor already receives. He also indicates that Ann Arbor residents would travel conveniently to other cities and villages in the county, but this is not a likely outcome, since what is intended are “express” buses designed for commuters. Note: This is one of a series of posts on the changing transit visions and plans in Ann Arbor. A list of posts can be found on the Transportation Page, which also has some links and resources. This entry was posted on December 17, 2011 at 7:31 pm and is filed under civic finance, Transportation. You can subscribe via RSS 2.0 feed to this post's comments. You can comment below, or link to this permanent URL from your own site. Thanks for following the issues so closely! As you’ve seen in the recent discussions, a strategy for long term capital funding is still very much in discussion. We’re looking forward to the remaining Financial Task Force meetings where they will take on this exact issue. Ultimately, though, it will be up to the countywide transit board to come forth with a proposal to local communities and voters. I especially would like to clarify the last point of “Let the people of the county decide.” The discussions about alternative funding sources are about finding sustainable sources of revenue that track more closely with transportation patterns or economic development, and help communities fund joint needs as fairly as possible, not subverting taxpayers’ right to decide. State law is such that any locally generated funding measure would have to go to the voters, not just millages. Thanks so much for reading and commenting, Sarah. Yes, new taxes (other than millages) would also likely need a vote. But I heard Mr. Ford say on the radio that philanthropic donations might be used. I am concerned about the possibility that a combination of donations and loans might be used to put together a public-private enterprise such as was proposed for the Woodward light rail project. Though it is evident that Ann Arbor will pay the most in any case, I feel that it is extremely important that the rest of the communities in the county make a commitment, both in principle and with tax money, to the new system, through a public vote. You are an amazing writer, Vivienne! Nothing to add and no questions to ask…just putting that out there. Thanks for doing this. Thanks, Patti, that means a lot, coming from you. Happy holidays! In addition to the charts you put together (thank you!) there are a couple of maps. Both of them show the high-capacity lines under consideration, and I note that they cross in Ann Arbor. 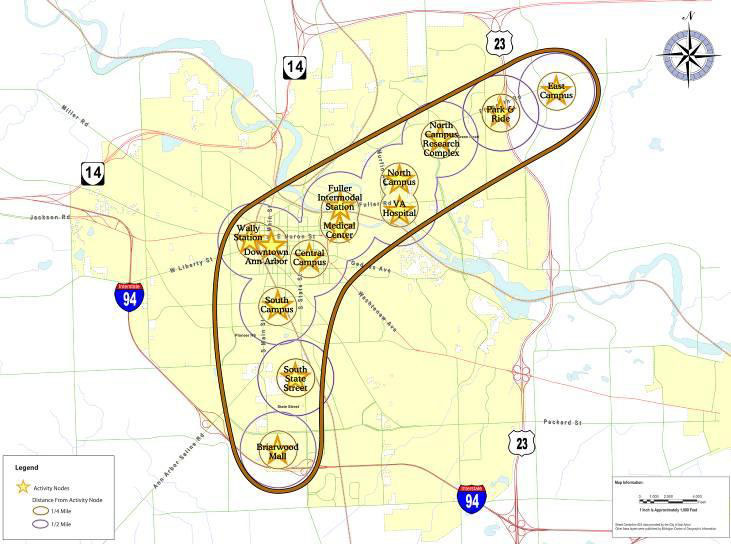 I also noted on AATA proposals that most of the new services go to Ann Arbor as well. Very few new services don’t include Ann Arbor. In effect, they extend Ann Arbor’s reach into the county for workers to come into town, and for city residents to go to jobs and entertainment outside of town. Now, perhaps you’re shuddering at the prospect of mingling so “promiscuously” with people who don’t live in your “Shining City on a Hill”, but it seems like a good idea to me. 🙂 Given that Ann Arbor is included in almost all the proposed improvements, it really does seem fair that Ann Arbor should be expected to pay the largest share of the cost. You also comment that the east-west commuter rail is not really so much a benefit to Ann Arbor residents, as to people who come to the city to work. Actually, the number of people commuting from Ann Arbor to points east is roughly the same as those coming to the Shining City. But perhaps you don’t consider it fair for Ann Arbor residents to pay for some of their number to leave town every day…? I also need to remind you, as I commented on your previous blog: it’s beneficial to Ann Arbor residents to have people come to work in the city, and it’s even better if they don’t bring their cars with them demanding parking spaces. Consider the 5th Street structure being built at roughly $72,000 per space. Like many of the proposed transit services, it is very costly, it has to be paid for in advance, and there is no guarantee that its revenues will ever repay its capital and operating expenses. I wonder if you’re looking at this whole transit plan in the wrong light? You write, “The purpose is where the money flows”. No, the purpose is where the *people* flow. Money is necessary, but it’s not the “driver”. People are the “driver”, in that the whole purpose of the plan is to get people where they need and want to be. Likewise, you see this as two plans – bus and rail. No, it’s one plan for moving people efficiently. Rail is more capital-intensive and less labor-intensive, it can move larger numbers of people of lower cost. (I’ve seen operating cost figures of 90 cents per passenger mile for bus vs. 70 cents per passenger mile for light rail, though I haven’t verified those figures.) The whole idea is to combine the flexibility of buses with the efficiency of rail to provide everyone the best public transit options at the lowest cost. First of all, Larry, I emphatically reject the notion that I don’t welcome people from other communities into Ann Arbor, and if you read my blog post titled “Our Shining City on a Hill”, surely you know that I was referring to UM and its separate existence from Ann Arbor, not the city itself.This is not about keeping people out of Ann Arbor. It is a question of equity. Why must the residents of Ann Arbor pay most of the cost of a regional system? AATA was originally set up to provide a transportation system within Ann Arbor because we were willing to pay for this service. We already pay to help people commute into Ann Arbor (the Park and Ride program is excellent) but when that becomes the primary focus of the system, we lose for our local transit needs. Actually, much of this system is being set up to help the UM with its transportation needs for its employees, and its own property is exempt from taxes, so in a sense we are paying twice to support the UM’s needs. I’m going to be doing a different post discussing tax issues. I don’t know where you got the idea that I was objecting to the east-west commuter rail because it is primarily to bring people in. I didn’t really comment on it except to say it was a high capital project. Actually, I don’t believe that it will ever materialize, and I am concerned that we will spend transit money on it fruitlessly. I apologize for painting you as an extreme isolationist, when you’re not. Please forgive me! As for commuter rail, it’s a relatively low-capital project, because most of the infrastructure is already in place. The 2006 SEMCOG-sponsored study of connections between Detroit and Ann Arbor compared light rail, (several routes), bus rapid transit (on Michigan Ave., I believe), and commuter rail. The Local Preferred Alternative was light rail, but there being no transit link between Ann Arbor and Detroit, ridership data could not be estimated according to Federal criteria and the project did not meet the standards required for funding. With that in mind, SEMCOG suggested a three-year commuter rail experiment as a low-budget way to determine ridership that would meet Federal standards. That was almost six years ago, so I can see why you don’t have much faith in the project’s success. However, it’s a self-fulfilling prophesy when people suggest withholding funds because a project might not be completed. Often money spent on studies of this type are useful down the road even if a project isn’t immediately forthcoming – I’m thinking of Troy’s multimodal station and, of course, the Woodward light rail project. More enlightened leaders can use the information to build upon in the future – the near future, I hope! I’ll be doing a separate post to discuss the economics of our local commuter rail situation. For the moment, I will only note that a commuter railroad requires funding for operation as well as for capital investment. The TMP calls for about $99 million in capital expenditures for the Ann Arbor – Detroit commuter rail over 30 years, and about $7.6 million for operation in year 30. That is 10% of the total operating budget for year 30. I question whether that is a good investment for the number of passengers it would carry. Vivienne, it’s interesting that you seem to be thinking about equity at the community level rather than the individual level. While you recognize that population is a determining factor, your followup table doesn’t break down the costs on a per capita basis. Maybe that’s partly behind Larry’s “Shining City” swipe. In any case, I think you’ve left out a relevant presentation of the data. That’s an interesting perspective, Steve, but I don’t quite follow your point. Are you implying that individual Ann Arbor taxpayers should carry a greater share of the cost of an expanded system merely because we have a greater share of the population? I haven’t attempted to analyze the recent census results in any detail, but Ann Arbor had a population in the last census of about 114,000 while Washtenaw County’s population was about 345,000. So while Ann Arbor is about 1/3 of the county’s population, its property owners would bear about 2/3 of the cost. In another example, Ypsilanti Township’s population is about 53,000, while the City of Ypsilanti is about 19,400 (about 1/3 of the township’s population). 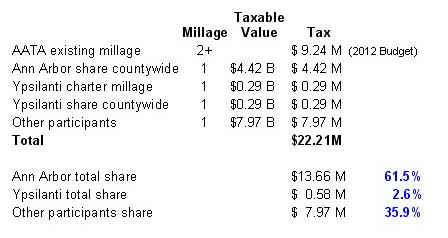 Based on a taxable value for Ypsilanti Township of about 1 billion, a one-mill tax would contribute 1 million to the countywide system, while the City of Ypsilanti would pay nearly 0.6 million or more than half as much. Looking at those two examples, it is clear that the proposed countywide distribution of costs per capita would not be equitable either, if equity is defined as an equal contribution per capita. Keep digging and writing, Vivienne! This is fine work. I hadn’t realized how large a burden we in AA City would bear. I wasn’t implying anything, just observing that the data was lumped by community rather than presented on an individual (or I suppose household would be a better alternative) level. By way of clarification, I was referring to the three “share” lines at the bottom of your first table. That’s still lumping it together by community. Again, it’s interesting that you are comparing by community-as-a-whole (or groups, if that’s clearer.) You might as well be saying that people with higher incomes and more valuable homes (on average) will pay more, since that’s essentially what comparing Ann Arbor to Ypsi comes down to. Just comparing millage rates would be straightforward enough. I see now that that framing stems from the first comment from city council. The key word there is “taxpayers”, which can be interpreted on the group (e.g., “Ann Arbor will bear most of the cost”) or individual level. I wonder if the group framing is a carry over from the recent discussions of “community share” for services. Whether funding through property taxes or on something else is more equitable is a separate question. An interesting question (the actual individual cost) – by division, Ann Arbor’s share would be about $39 each, City of Ypsilanti $30 each, and Ypsilanti Township $19 each. I’m not going to try to figure out other jurisdictions (since not all townships are participating, I can’t readily calculate the cost per individual for the rest of the county, or more accurately I’m not willing to take the time to do it.). Of course, that doesn’t relate to what benefit each separate individual everywhere would get from the system. I’m happy to pay for benefits I will never use, as I’m a believer in pooled resources. But when it comes to equity in contribution between entire communities, that becomes more complicated. Vivienne, I am curious as to AATA’s reserves and how they have begun to finance present day service enhancements using these funds. This is an indication to me that AATA just may be running a deficit as Roger Kerson or Charles Griffith I believe quips that AATA needs a cash infusion soon. I see the massive all day increase in service for Route 4 as overkill; I question the benefit of Air Ride vs the cost. So with all this ranting that I am doing; how long can AATA continue to dig into the reserves before the bottom starts to loosen? I can not help but consider that perhaps if this County wide millage fails, will this put AATA into a severe financial situation that may necessitate significant service cutbacks? Yes, I agree with your conclusion. At a recent committee meeting, Michael Ford introduced the idea of reducing the amount of reserves further. It will be a subject for a Board retreat in May. I can’t answer the “how long” question. AATA appears to be gambling that everything will fall into place just right. Even the Financial Task Force that recently met offered a number of cautions that apparently are not being heeded. Further, it appears unlikely that a millage vote will be staged this year, which means that it probably won’t be attempted until 2014. This seems to take AATA even further out on a limb.